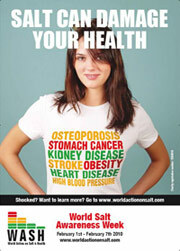 The focus of World Salt Awareness Week 2010 is ‘Salt and Your Health’. Many people are aware that salt can damage their health, but do not know it is linked to serious health conditions such as stroke and heart failure. There is also increasing evidence supporting links between our current high salt diets and the onset of stomach cancer, osteoporosis, obesity and kidney stones and kidney disease. The UK arm of WASH, Consensus Action on Salt and Health (CASH), published new research showing that whilst as many as 9 out of 10 people in the UK know salt can damage their health, very few have any idea how. For instance only 34% are aware it can lead to stroke, and 61% heart disease. Even less people are aware salt is linked to conditions such as osteoporosis (4%), stomach cancer (6%), obesity (13%), kidney stones and kidney disease (27%), which can affect anyone. CASH is working with a number of charities this year including Asthma UK, Blood Pressure Association, British Heart Foundation, Cancer Research UK, Diabetes UK, Kidney Research UK, Ménières Society, National Obesity Forum, National Osteoporosis Society and Stroke Association. Together, we aim to highlight to the public the risks involved with a high salt diet and the importance of looking at labels to ensure high salt foods are not consumed.